IU will travel to University of Kentucky, Auburn University and Stanford University. IU sweeps the steeplechase as part of strong weekend in Knoxville, Tennessee. After taking last week off, the Hoosiers return to action. 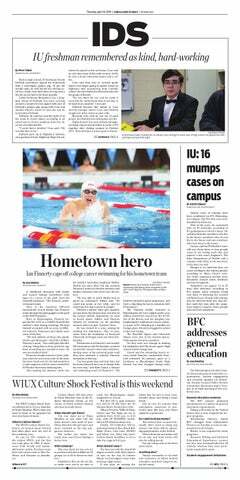 IU set school records, personal records and posted NCAA leading times this weekend. IU will travel to both Florida and California this weekend. IU concluded its indoor season in Alabama this weekend. Numerous athletes can help lead IU back to the top this season. The Alex Wilson Invitational will be IU's last regular season meet. IU grabbed top finishes at the Tyson Invite, Iowa State Classic and Hoosier Hills meet. IU athletes will compete at Iowa State, Arkansas and at home this weekend. IU set several personal records this weekend. IU will face off against teams from the Power 5 conferences at Michigan. The men's distance medley relay team ran the best time in the NCAA this year. The event takes place at Gladstein Fieldhouse. Sophomore Cooper Williams won both the 600- and 400-meter events. IU is hosting 12 other schools in the annual invitational. Both the men's and women's teams each recorded two national records. Twenty teams will partake in the event. Junior Maggie Allen and freshman Ben Veatch both earned second team All-American honors at the NCAA Championships. The Hoosiers had four competitors earn second team All-American honors.